For newspapers, 2015 might as well have been a recession year. Weekday circulation fell 7% and Sunday circulation fell 4%, both showing their greatest declines since 2010. At the same time, advertising revenue experienced its greatest drop since 2009, falling nearly 8% from 2014 to 2015. Fully one-fourth of advertising revenue now comes from digital advertising, but not because of growth in that area: Digital advertising revenue fell 2% in 2015. It’s just that non-digital advertising revenue fell more, dropping 10% in 2015. In 2014, the latest year for which data were available, newsroom employment also declined 10%, more than in any other year since 2009. The newspaper workforce has shrunk by about 20,000 positions, or 39%, in the last 20 years. And three newspaper companies – E.W. Scripps, Journal Communications, and Gannett – are now one, reflecting a trend toward consolidation in the industry. Nevertheless, most of the newspaper websites studied here experienced growth in traffic, and mobile traffic in particular. Overall, however, the industry continues to shrink, with Editor & Publisher’s DataBook listing 126 fewer daily papers in 2014 than in 2004. Weekday circulation experienced a decline not seen since the immediate aftermath of the Great Recession. 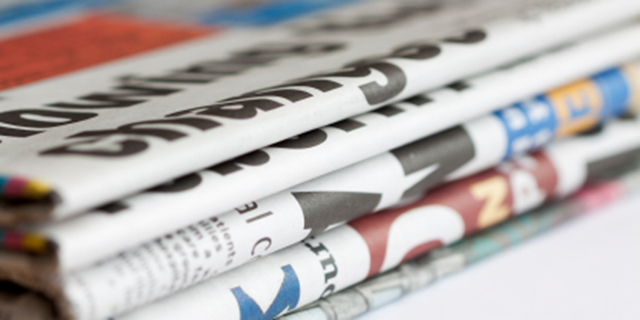 Average weekday circulation fell 7%, the most since 2010. This drop was due entirely to print circulation, which declined by 9%, while digital circulation increased by 2%.1 Sunday circulation, meanwhile, fell 4%, following a 3% decrease in 2014. As with weekday circulation, the fall in Sunday circulation was due to a decline in print circulation, which fell 5% while digital rose 4%.2 For both weekday and Sunday circulation, the fall represents a continuation of the trend that began in 2014. After 2009, circulation seemed to be cutting its losses, even showing a small increase in 2013. But after a decline of 3% in both weekday and Sunday in 2014, 2015 saw circulation fall even more rapidly. Note: Due to a change in AAM’s reporting period, comparisons from 2003 to 2014 are based on six-month averages for the period ending Sept. 30, while comparisons for 2014-15 are based on three-month averages for the period ending Dec. 31. Data do not include affiliated publications. Weekday circulation only includes those publications reporting a five-day average. 2015 analysis incorporates weekday circulation from 282 publications and Sunday circulation from 517 publications. Source: Pew Research Center analysis of Alliance for Audited Media data. Source: Nielsen Scarborough data: Nielsen Scarborough USA +, Current Six Months, R2 2014 – R2 2015. 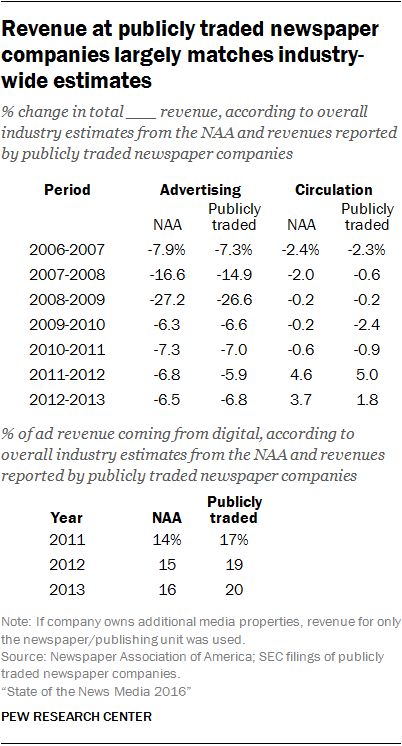 In 2014, the Newspaper Association of America (NAA) stopped releasing industry-wide revenue data. Its last reported figure was total revenue in 2013 of $37.6 billion, with $23.6 billion in ad revenue and $10.9 billion in circulation revenue. Since then, it has become necessary to come up with a proxy that helps give a sense of the industry. One way of doing this is to examine revenue data from publicly traded newspaper companies (whose number has declined from nine to seven over the past 10 years,3 representing about a quarter of all U.S. daily newspapers) – which are legally bound to release these figures. This cannot be used to calculate a total revenue amount for the industry as a whole, but it can provide a good indication of year-over-year changes. Source: Year-end SEC filings of publicly traded newspaper companies. Source: Year-end SEC filings for the New York Times Co., McClatchy, A.H. Belo, Lee Enterprises and E. W. Scripps. Note: Chart shows net profit for entire company, which for some companies includes revenue and expenses from television stations, websites or other media holdings. Source: Year-end SEC filings of publicly traded companies that own newspapers. The Newspaper Association of America last reported revenue figures for the newspaper industry as a whole in 2013. Since then, no alternative source of this information has emerged that is both reliable and consistently available. Pew Research Center now uses revenue data from publicly traded newspaper companies to track newspaper revenue. In 2014, there were nine publicly traded newspaper companies, though the number fell to eight by the end of 2015 due to the merger of Journal Communications and Scripps’ newspaper units into Journal Media Group, and has shrunk to seven now that Gannett’s subsequent purchase of that new company is finalized. These companies together owned more than 300 newspapers at the close of 2015. The primary downside to analyzing industry revenue using only publicly traded companies is that most U.S. newspapers are privately held. Newspapers owned by publicly traded companies represent about a quarter of all daily papers and nearly a quarter of all newspaper revenue. (In 2013, the ad revenue generated by publicly traded companies made up 20% of total industry ad revenue as identified by the NAA and 26% of total circulation revenue.) However, as can be seen in the table below, changes in revenue for publicly traded companies track fairly closely to the NAA’s overall estimates. As such, we feel comfortable moving forward with this new metric for revenue. When the company did not produce an analysis that showed the revenue change using a consistent base of publications, the company was excluded from analysis for that year. (As such, New Media Investment Group is not included in calculations for 2012-2013, 2013-2014, or 2014-2015.) For years that are 53 weeks long, 52-week adjustments are used when available, though not all companies provide these adjustments. All companies use a January-December fiscal year, with the exception of Lee, which runs October-September. Notes: Data for each year come from the next year’s edition. Source: Editor & Publisher Newspaper DataBook. 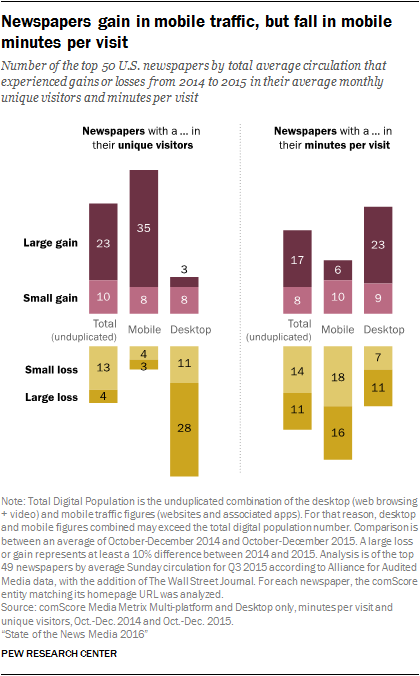 As mentioned above, newspapers’ web traffic outpaces their circulation by a substantial margin. For the 49 of these U.S. papers reporting Sunday circulation (The Wall Street Journal does not publish a Sunday edition), average monthly unique visitors for the third quarter of 2015 was anywhere from two to 78 times greater than average Sunday circulation for the same period.4 This is the case despite the fact that more people self-report reading newspapers in print than in a digital form. This points to the difficulty of diagnosing the digital health of newspapers. Web traffic is high, but a reader who stopped by for only one article may be counted the same as a subscriber who visited daily. Clearly, however, many of these one-time visitors do not think of themselves as newspaper readers – and, indeed, single-article visitors may only stay for a short amount of time, while subscribers could spend considerably more time on the site in a month. The challenge for newspapers, then, is to convert these grazers into loyal readers.